Just an Average Mormon: Is it Normal for Members to Feel the Holy Ghost? This post is by Megan Wyatt. I was raised in a Mormon family. But that is not why I am a Mormon. The reason I am a member of The Church of Jesus Christ of Latter-day Saints is because when I pray to know if it is God’s church He confirms that it is. When I was doing my undergrad I had a conversation with one of my professors about the church, she was not a member but had been living in Utah for about 11 years and thought she knew quite a bit about it. In our conversation we got onto the topic of the Holy Ghost. One of the questions she asked about it was whether it was normal for members of our church to experience feeling the Holy Ghost. I was surprised by the question and I can’t remember what I said exactly, of course it is normal but I had never considered the implications. Now, looking back I wish I had understood the importance of the Holy Ghost, because in fact, the reason people join the Church is because they feel the Holy Ghost. Converts are converted by the Spirit. We find answers to our questions through the Holy Ghost. After baptism we receive the gift of the Holy Ghost and we are promised that if we strive to live worthily, we will have constant companionship of the Spirit. I am sorry to say that I take that for granted sometimes, but every once in a while I am reminded of the awesomeness of it. What an incredible gift, to be able to have a personal relationship with Deity. Each one of us matters to him. If you ever need to be reminded of your worth, all you need to do is ask. When doubts arise, whether they are doctrinal or just the stresses of life, we can go to the Source and we can find peace and reassurance. 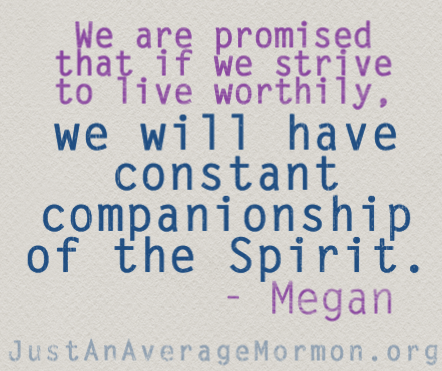 The name of this blog is “Just an Average Mormon” but of course we know that no two Mormon’s are alike. We all have different personalities, backgrounds, and interests, but one thing we all have in common is that we have all felt the presence of the Comforter testifying to us that our Heavenly Father loves us and that this is His Church. What an incredible common denominator! I am so grateful for the personal relationship that I have with my Heavenly Father and for the Holy Ghost that speaks peace to my heart. I know this church is led by inspiration, and it is true. Thanks for sharing. I think that the spirit is more present than we often realize. Like you said we take it for granted. There is so much more help and guidance available to us if we only accept it.